It isn’t a joke. This little headline includes our essence, our technical/productive capability and our being typical. Our story dates back to a remote past when textile industry was a booming sector in our district. We have always been known as well-advanced in our productive specificities and we still keep on being innovative thanks to our experience of various decades. Even if we produce “only” labels , we can’t confine ourselves to that “only”. This because also a label for a item of clothing has its proper image, its value and it expresses just that value in its manufacture and its quality. We have always believed that in small things it’s easier to recognise the inner value of a work, a job or an art, and the fusion of these elements creates a high-quality product. We do like our job, it’s clear! That’s why we think that your brand, on a label, it’s a value for us. 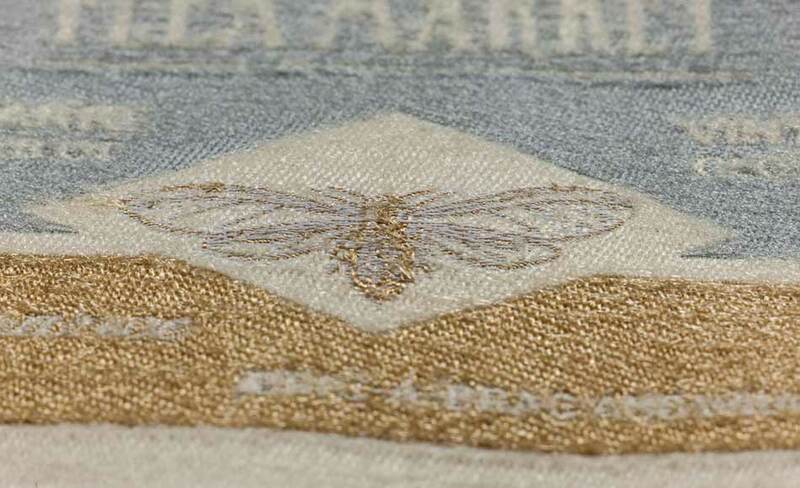 otherwise, which value would it have if it was a frayed label, with low quality , weaved with poor quality materials which tend to make the item less well-finished? it would be the total denial of our work that we do with passion and, in this case, we would not deliver a good service to anybody. Actually we do. 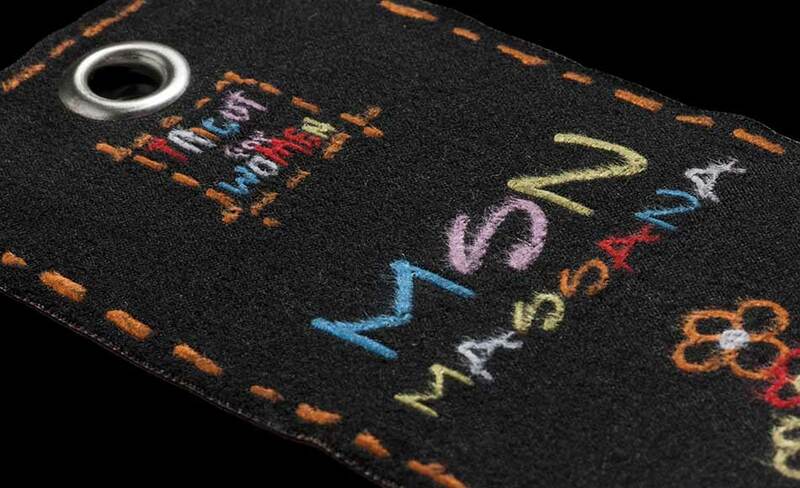 we produce labels for clothing of every size, in cotton and ecosustainable textures. but the truth is that we take care of your brand , as if it was ours, because this is the real value of what we are able to be and to do. This is one of the reasons why we have decided to keep on searching more and more ecosustainable materials, pleasing to the touch, on the skin, that may last for long, that may give luster to the whole clothing item, including the brand. 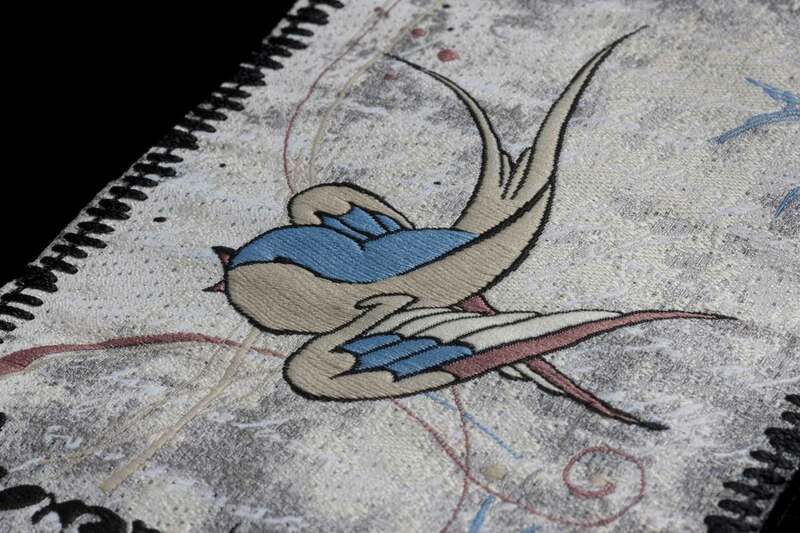 The art can be seen in the innovation on materials, on colours, on yarns. The job can be seen in the product’s quality, never trivial and always very accurate. The work in the tirelessness in trying to make always the greatest efforts, even in difficult periods. improving the quality of their presence on the market. The quality of the product , even if it represents a fundamental value of our activity, isn’t a goal to achieve but it is simply a way to satisfy our clients in order to reach their social goal. It’s focused on the search for product quality and service rendered. We strongly believe that the business of a company has as its maximum goal the loyalty of costumers. 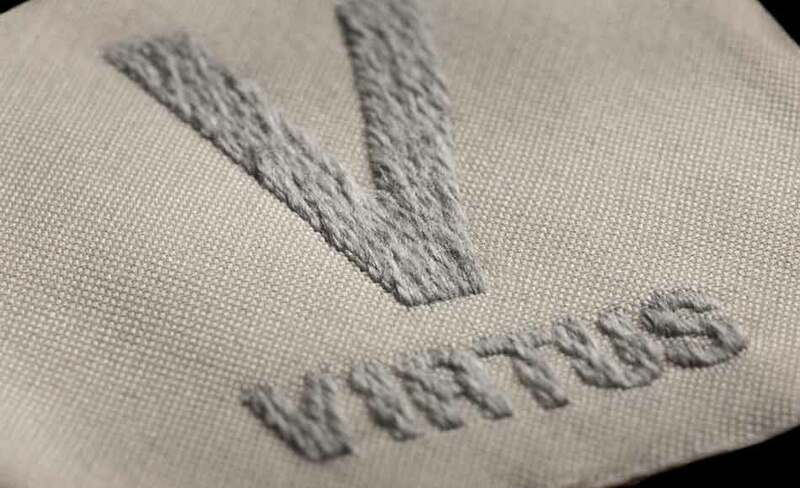 Natural fibers, sustainable yarns and recycled polyesters … we work with respect for the environment. 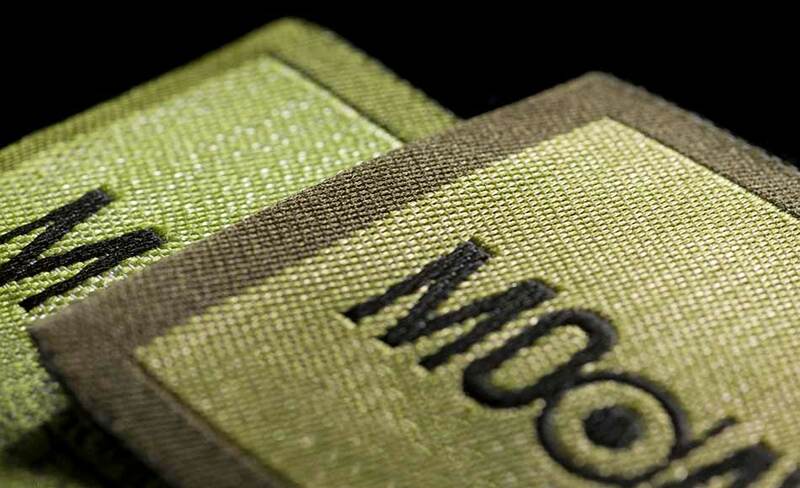 One of our strengths is that we go on experimenting new techniques of weaving that, along with the constant research of new materials, give us the possibility to create new products. 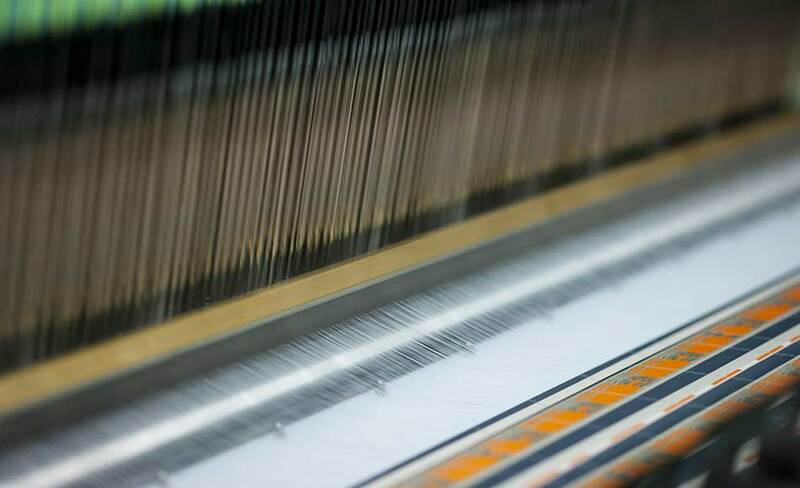 We list some of the materials that we utilize: sewing threads, “policotonieri”, “virgolina” , metal yarns, rolled like blades, laminated fabrics such as “lame”, thinner and finer strips, matt and shiny single-threads. Gfs srl is also engaged in using more and more sustainable yarns, such as recycled polyesters and 100% natural fibres such as: cotton, silk, linen, wool , hemp. 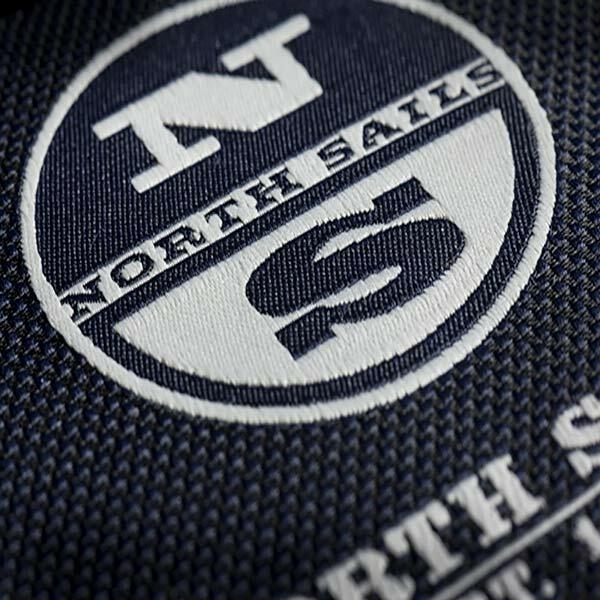 All yarns used for our products are of excellent workmanship. Gfs, since ever, focuses on meeting the market requirements. 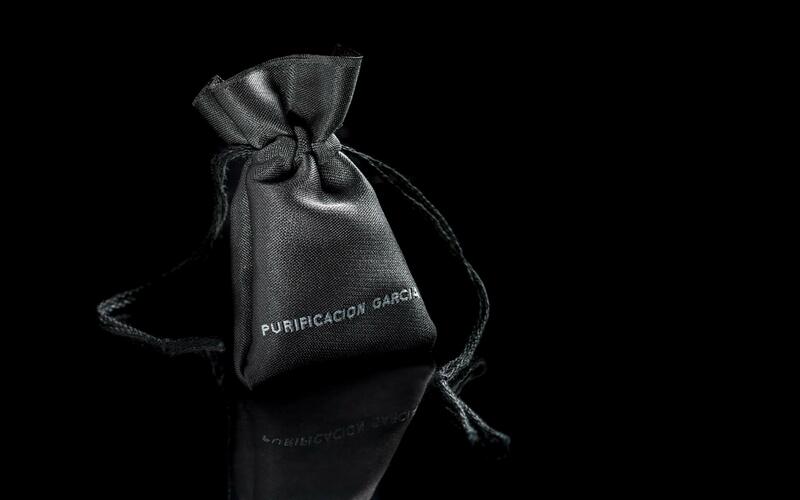 Moreover, it is in the forefront in the development of unique and high quality products, with a great care in details through different types of processing. 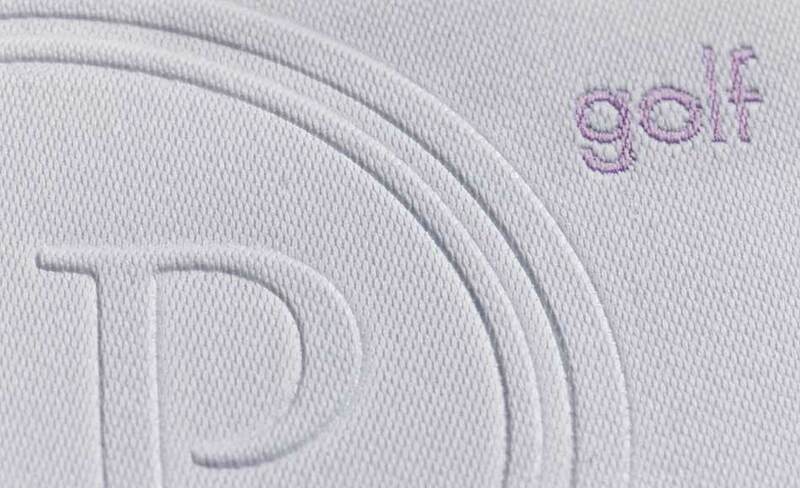 Ultrasound cut:it allows to obtain soft and precious borders on tape and weaved labels, so that they don’t chafe in contact with the skin; this is an essential technique on products for children clothing and underwear. Thermal-fixing ironing:it avoids washing shrinkages once you have used the product on the item. Calendaring and polishing:it gives more softness and brightness to the texture. Sizing with rigidity regulation:it gives more consistency to the texture. Implementations of supports to textures:double-sided tape , standard and strong thermo adhesive, “frisellina” and polyurethane supports. We have laser machineries for every kind of punching, from the simple hole or slot to the ordinary coat of arms weaved in any size, to the most difficult processing such as etching, alphanumeric progressive numbering, creations and etchings of barcode and progressive QRcodes and difficult micro perforated texts in very high definition. 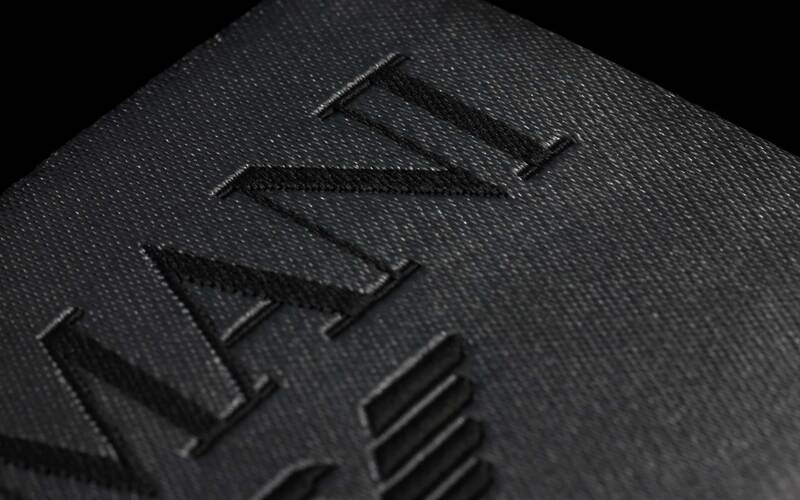 Embossing:it’s a hot processing creating a 3D effect on any type of texture and size. 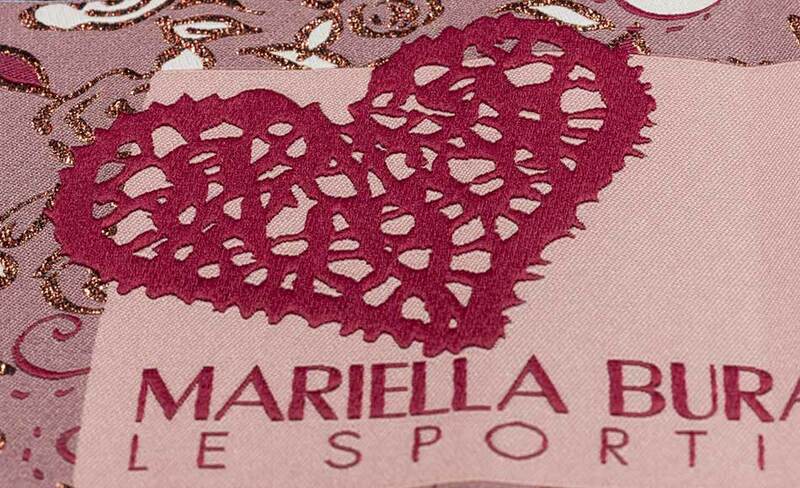 Emery-polishing soft touch effect:this technique allows to give to the textile a soft touch. 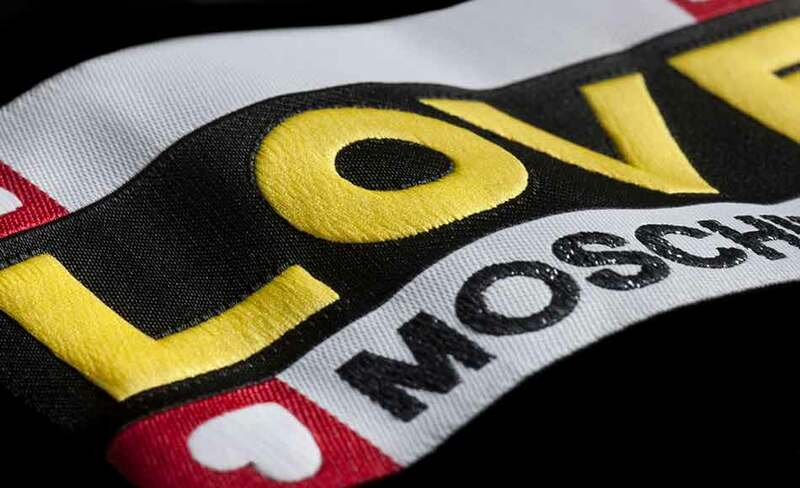 Thermo transferable sublimation dwhich is also calledtransfer print:this technique allows to transfer any graphic design or back fantasy directly onto the texture, offering a great flexibility of creation. 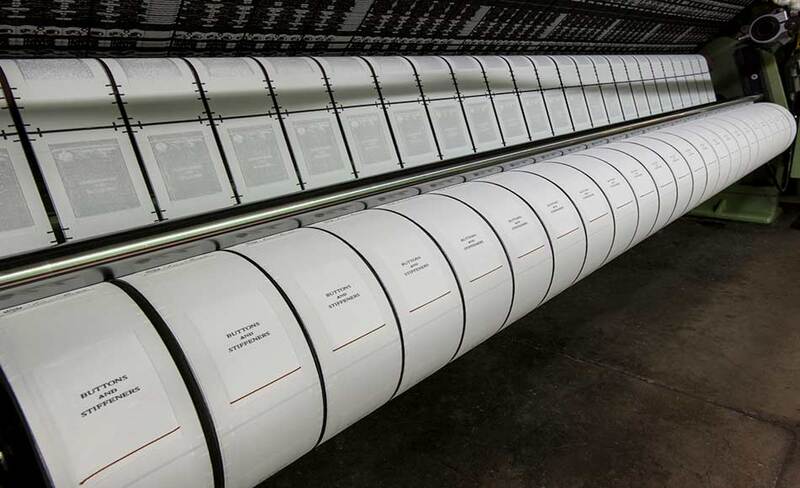 We have also a huge quantity of machineries for cut and fold and packaging, from the classical standard side folds and flag to the most complicated folds such as Mitra open or closed “Manhattan”, book cover , four sides and longitudinal folds. Taffetà, straight satin/backhand satin, high definition (HD), tubolar, frames … for create without limits. What does “definition of a label” mean? 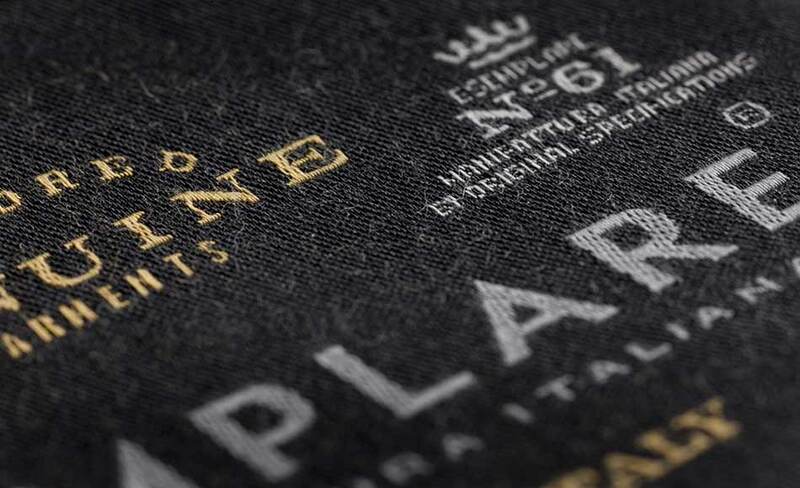 The label definition is the precision with which the design or text is weaved. The more definition is given, the more precise details are presented. The higher number of insertions of weft (“battute”) per cm., the higher number of filaments of warp per cm., the more defined is the label. These two factors must anyhow always be balanced between them with the suitable thickness of filaments (Deniers) either of warp and weft. 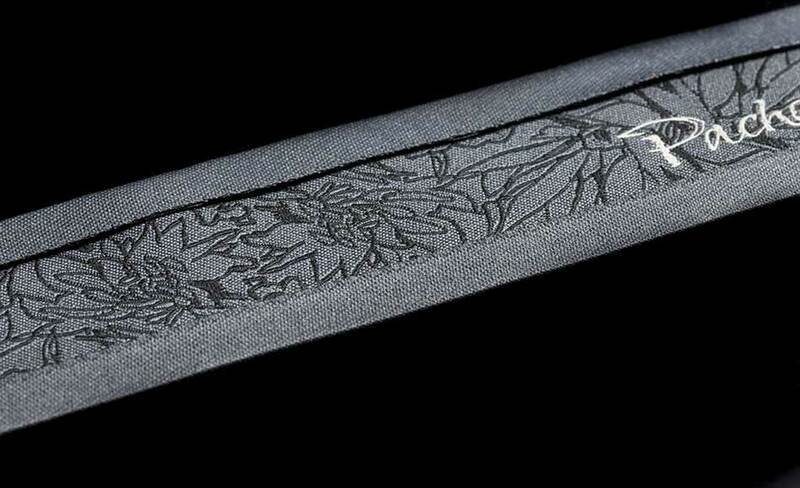 Taffetà’ (TF): it’s the simplest and lowest quality, with a few weft insertions and a few filaments per cm. This type of label is the cheapest one. 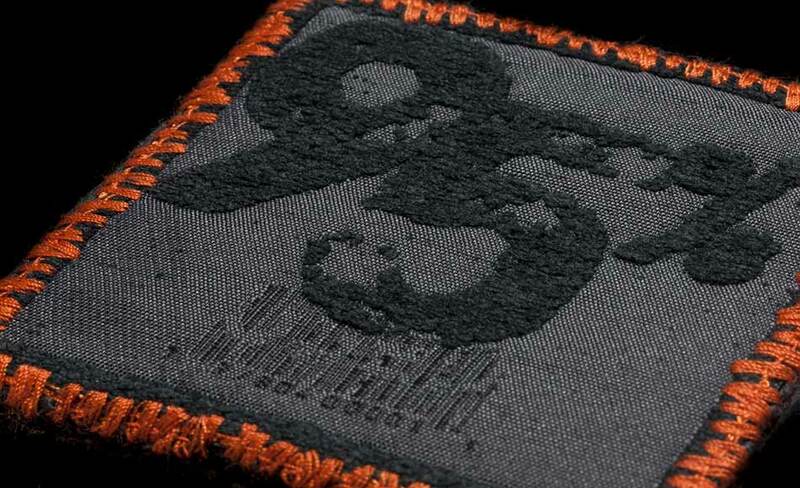 They can be made either by close traditional selvedge finish and by heat welding or ultrasound finish. 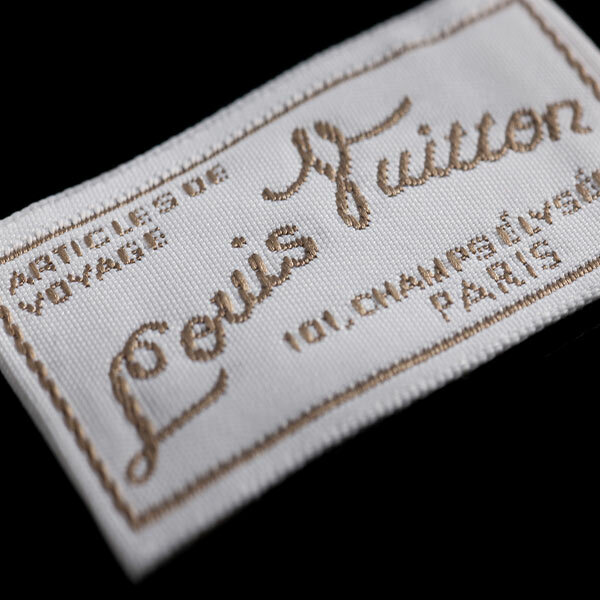 The main features of taffeta label are the brocades which are completely unbound on the back because otherwise visible at the bottom of the label and the ligature stitches on the design , or text, which are very evident. The textile is very light and the colours of brocades are very evident, if they are weaved with white warp. 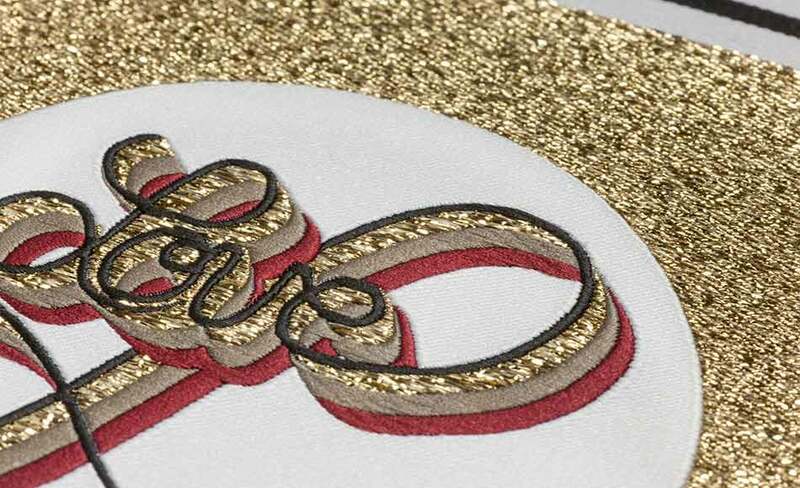 Straight Satin (SD)/Backhand Satin (SR): they can be made either with close traditional selvedge finish and with heat welding or ultrasound finish. This kind of weaving, with more insertions of weft and warp filaments per cm than taffeta, allows to get a higher definition and a more compact “hand”. 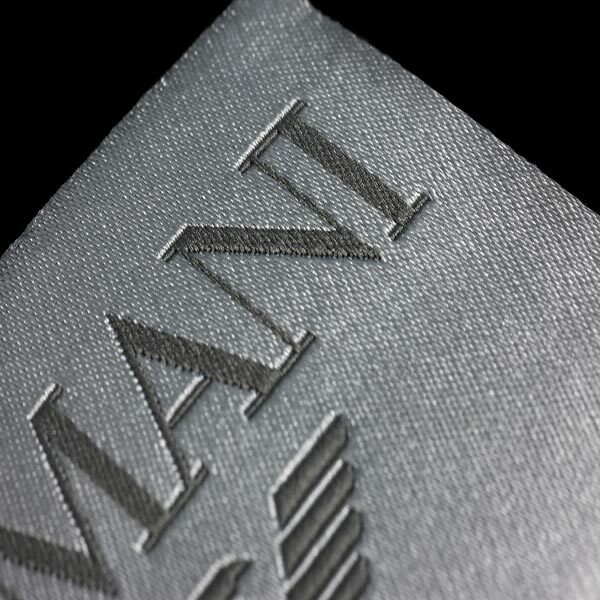 Straight satin makes the back of the label very smooth but it doesn’t allow to give a compact colour to the back. This because the backs on white warp tend to be very light, almost white, whereas those on black warp turn out to be very dark, almost black. 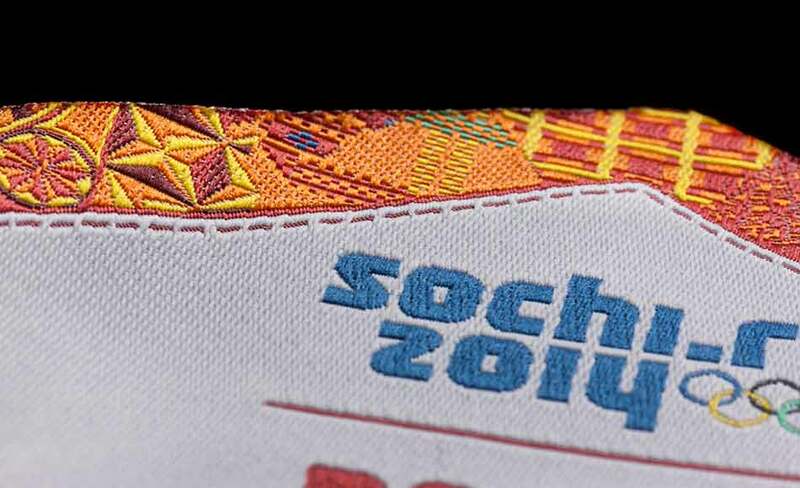 On the contrary, the backhand satin allows to obtain more coloured backs. Of course, from white warp we obtain light colours and from black warp we obtain dark colours. 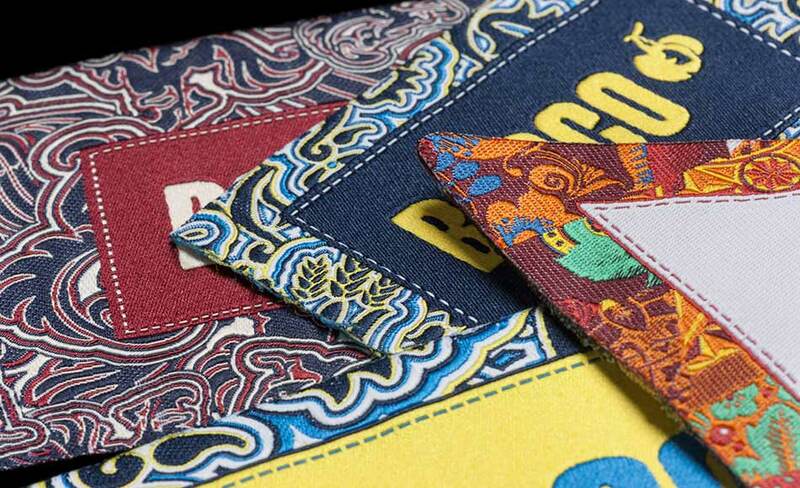 Colour back (FC): they can be made either with close traditional selvedge finish and heat welding or ultrasound finish. 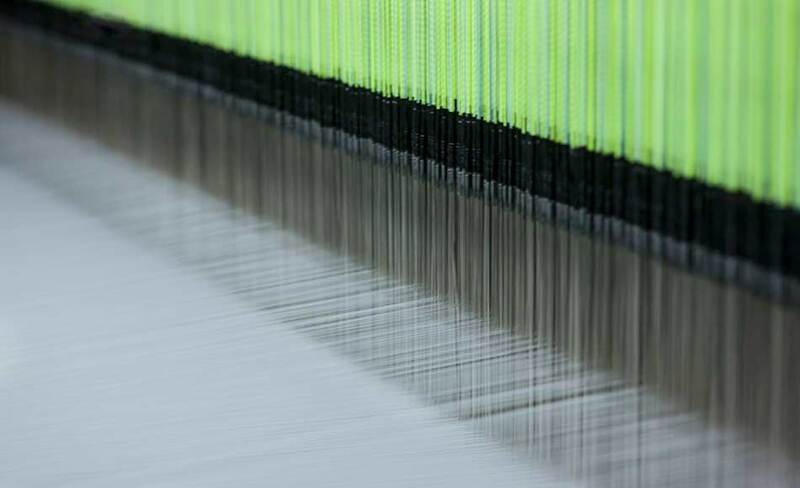 It is a frame structure which can be compared to the high definition one (hd) for the possibility of having a wide range of intense colours, but with a clearly lower quality for weft insertions per cm. 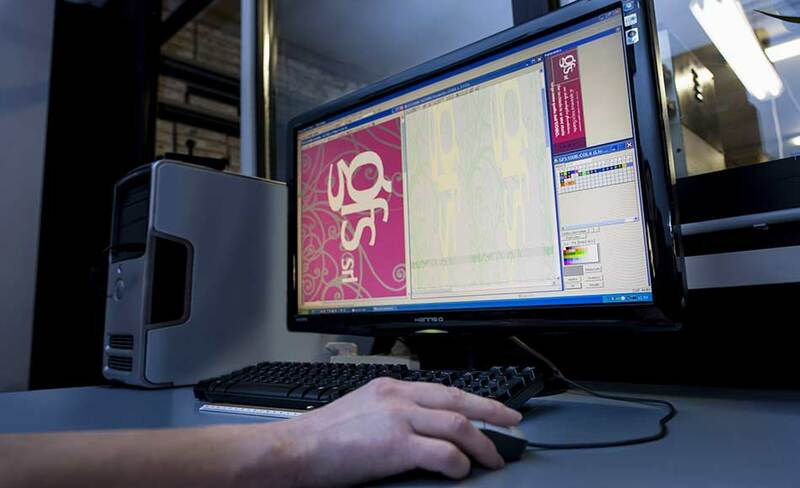 It is rarely used and mainly used for products requiring a low cost but where we want to obtain bright colours and not too precise graphics ( labels for children clothing for large retailers.). High definition (HD): they can be made either with close traditional selvedge finish and with heat welding or ultrasound finish. 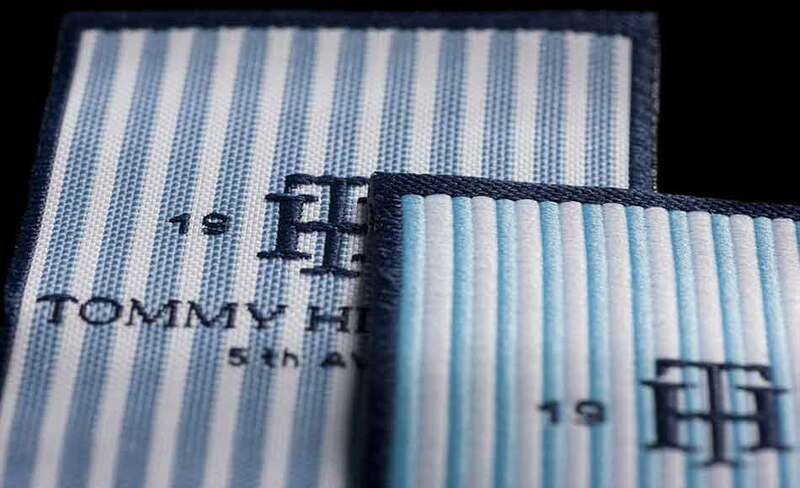 It is the highest standard quality in weaving and, depending on the insertions of warp and weft filaments (that may vary), it allows to have a great precision of reproduction of logos and /or designs also of medium and small size. This technique is one of the most used ones because it allows to obtain full-coloured backs and very readable texts. 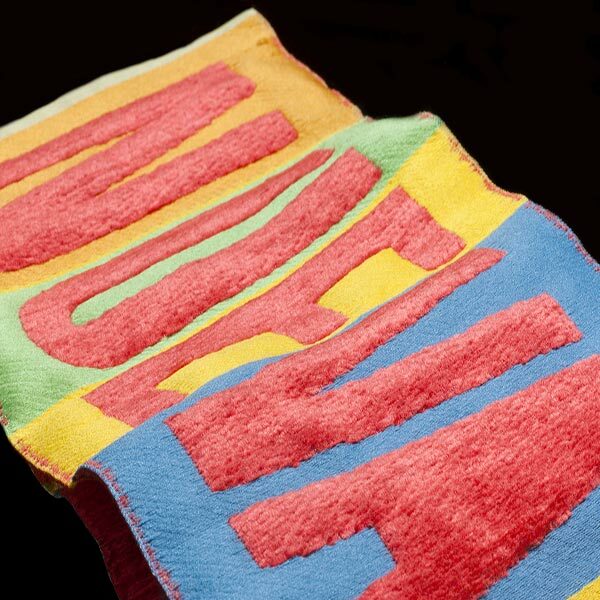 Iper Definition o High Definition Extra (HDE): this is absolutely the highest weaving quality, out from the standard. It can be made either with close traditional selvedge finish and with heat welding or ultrasound finish, but the ultrasound finish is extremely recommended. This quality allows a very precise graphic definition and it is comparable with the print, with extremely readable and full colored texts or micro texts, without any kind of imperfection. 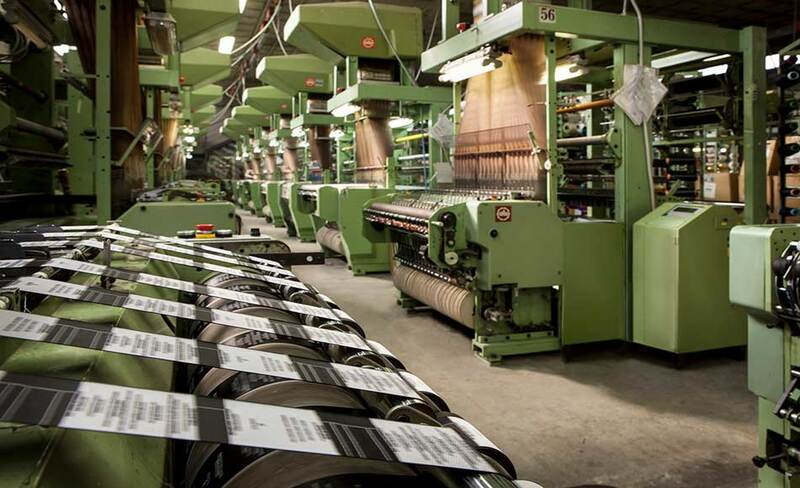 Tubolar (TB): the tubolar weaving can be produced with whatever finish and in every kind of quality ( taffeta, satin, colour back and high definitions) with every processing. The peculiarity of this weaving is that we work on two or even more sides. The more sides there are, the less defined is the obtained quality; this because the number of warp filaments on which we have to work is distributed on all the required sides (I.e. classical Tubolar on warp Satin 120 filaments /cm: on every side there are 60 filaments per cm). Frames and back effects: on every quality type, it is possible to get processing and special back effects with special frame structures such as Twilled, Diagonal, Gross Grain, Twin Line (horizontal gross grain), raw linen, fine linen, Canvas, “Pied de Poule”, iridescent fabric, marbled and melange effects. All these processing can be personalized according to the customer’s whish (more or less evident). Weaving is the art of fashioning a textile as result of weaving warp and weft filaments. 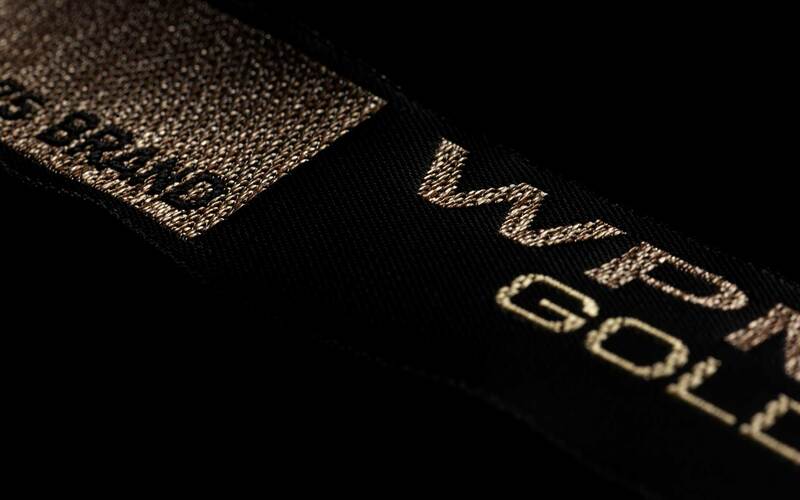 Warp: it consists of filaments with a vertical texture that, being weaved with those of weft, shape the base of the texture. 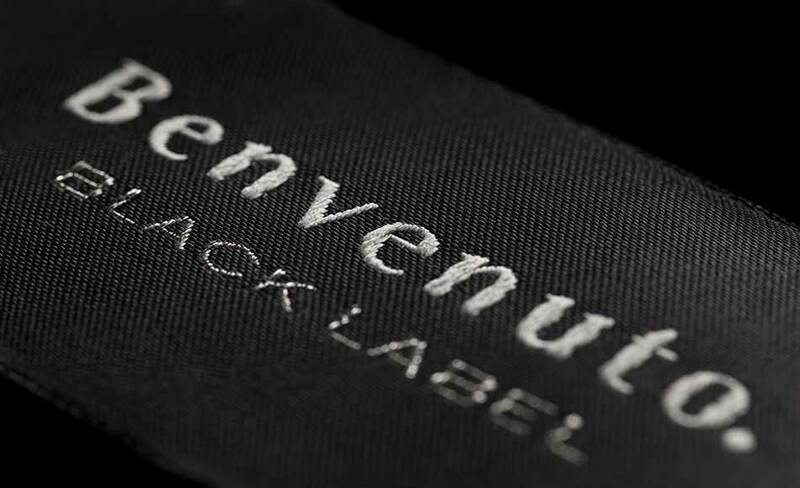 They can vary in number per cm., they define the base quality, “taffetà” – semi satin – satin of every label and they are generally black or white. 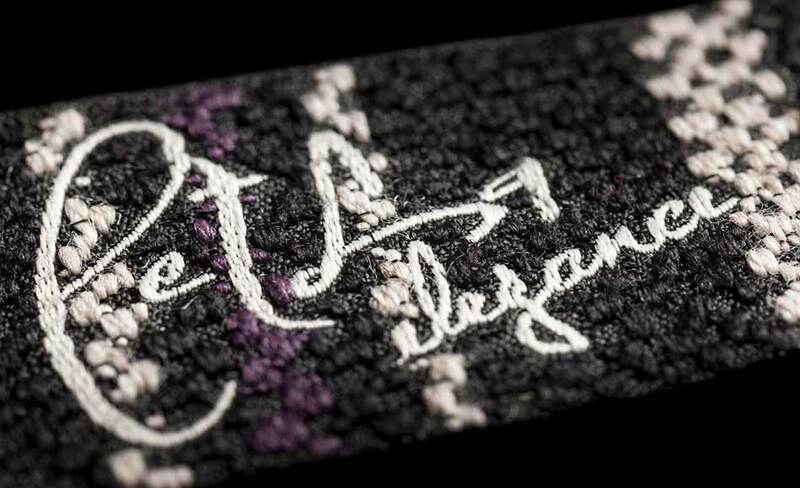 When the warp is black, we give a darker shade to the weft colours and when it is white, we give a lighter shade. Weft: these are filaments with a horizontal texture. 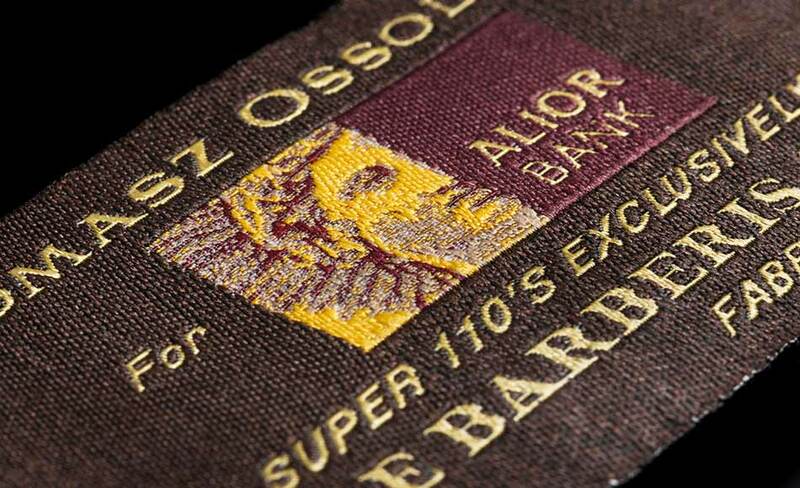 It is called “basic weft ” the one that, weaved with the warp, represents the base of the label and gives the basic tone. 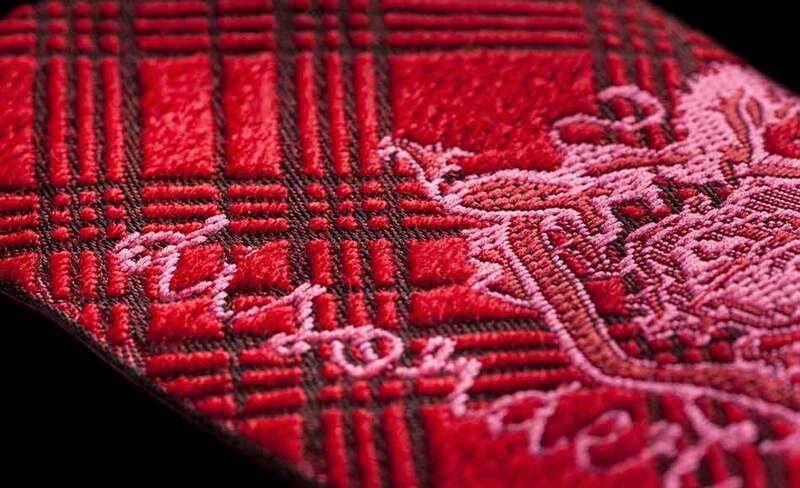 Then, the brocades generally form the logo / name / design of the label and they can be of any colour. 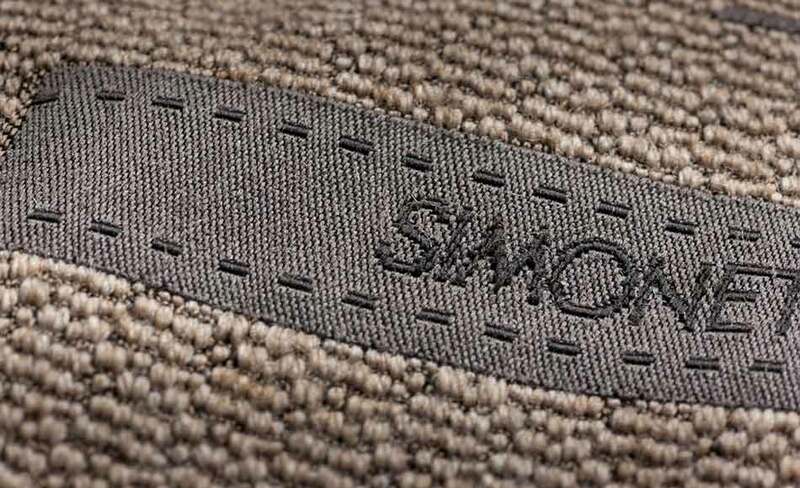 On the contrary of the warp, in which the quality is defined by the number of filaments per cm., in the weft the quality is defined by the number of insertions per cm., (which are called “battuta”). We have been using for several years machineries and productive plants of latest generation, where air, pincers and needle are the main elements to define a state-of-the-art production. But this is not enough. In fact, if we don’t choose the best and more innovative materials, machines are not sufficient. 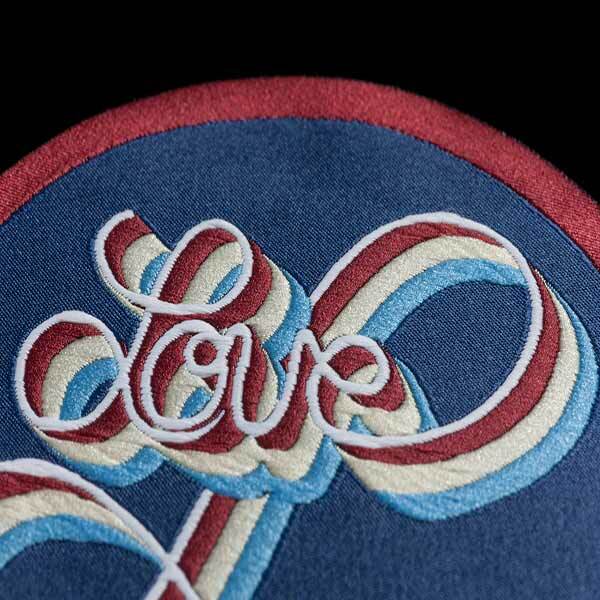 We are able to work with every kind of filaments, from the most refined ones to those of finest deniers. Moreover, we are able of utilize at the same time a wide range of colours to produce labels, tapes, official badges and envelops with a high definition and an advanced graphics. Consequently, graphic possibilities increase greatly, so that our customers can benefit from them in terms of creative development and brand. In this way, we produce extremely readable texts and micro texts, with more and more complicated characters, due to the fact that there are no more limitations of fonts. Nowadays it is possible to reproduce every kind of font available on the market. 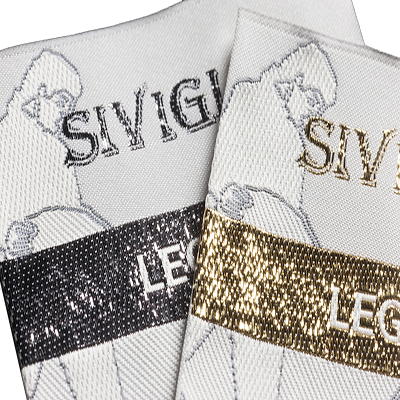 Finish close traditional selvedge: close traditional selvedge label has the peculiarity to weave individually every tape, every weft which starts and finishes at the same side of the tape (one-way and return); special bindings or weavings give to the label the specific softness that is one of its main features. It is mainly used for underwear, children clothing, shirts and others clothing items whose labels are in touch with the skin. 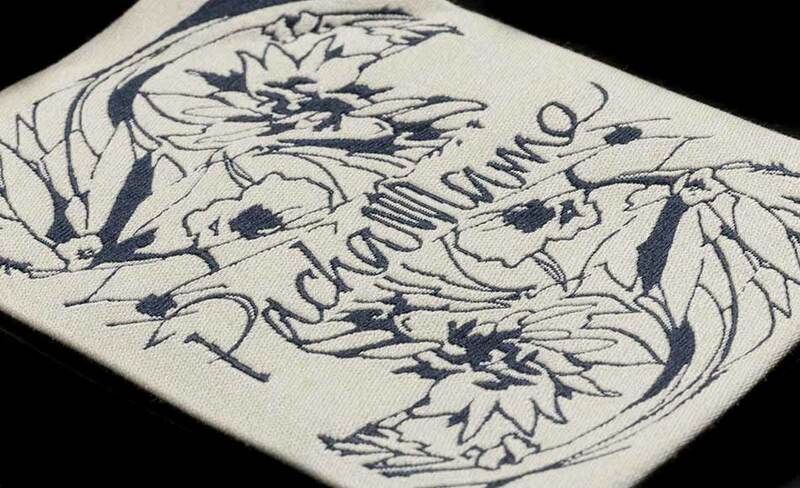 Another peculiarity of the close traditional selvedge label is that there is a correspondence between every height and every loom. Heights: we can start from 5 mm to reach also 50 mm, with white or black 100% cotton warp base. 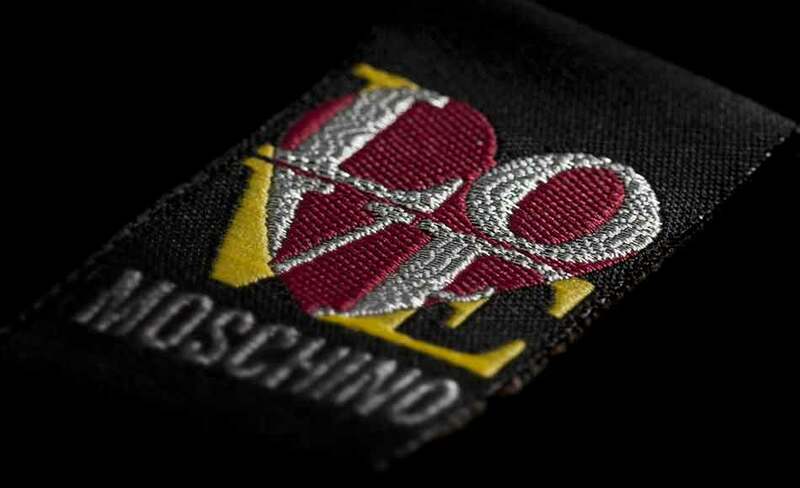 Depending on the height that can vary from 5 mm to 1000 mm, the label is repeated “n times” until the final size of the piece is achieved. 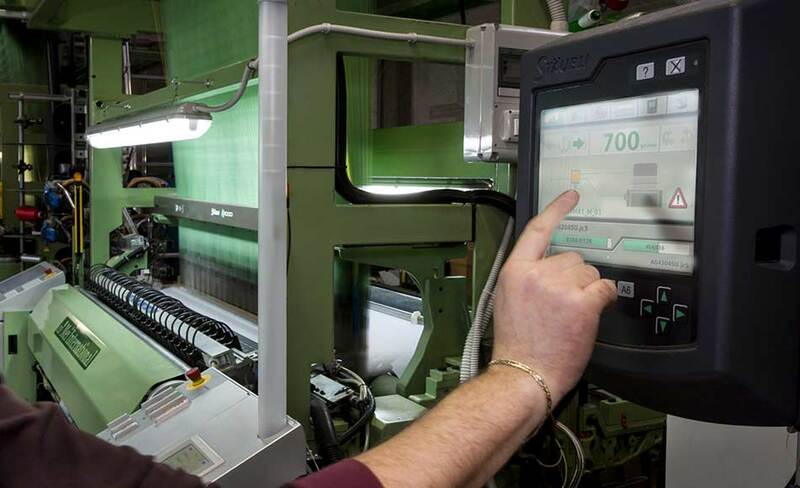 Simultaneously, it is cut on the loom with a heat knife system. These last ones, by cutting, merge the spun (mostly made of polyester) and weld the borders. That’s where the name “ heat welded” comes from. 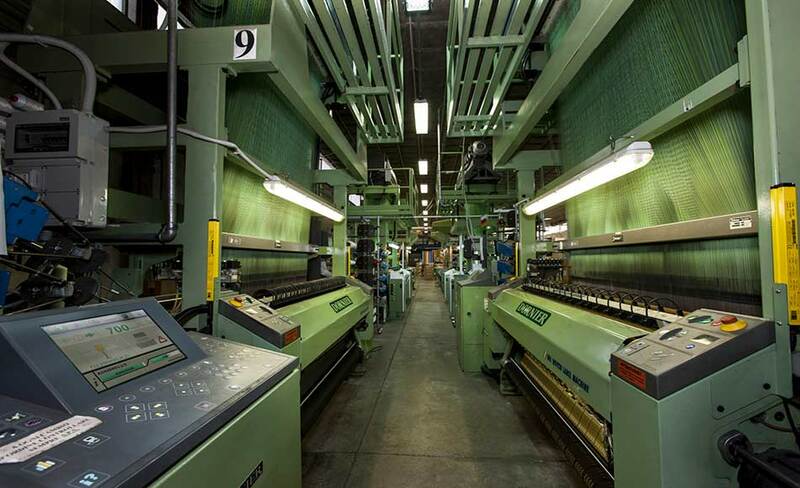 This type of loom allows to use from 8 to 12 different weft colours at the same time. 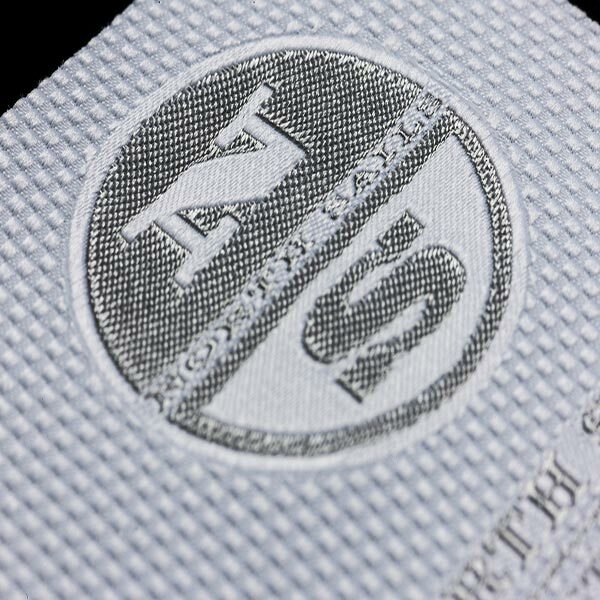 The heat welded label has the strength of offering the product at a cheaper cost, with the same quality as the close traditional selvedge label , and it also allows to elaborate and appreciate more the details. 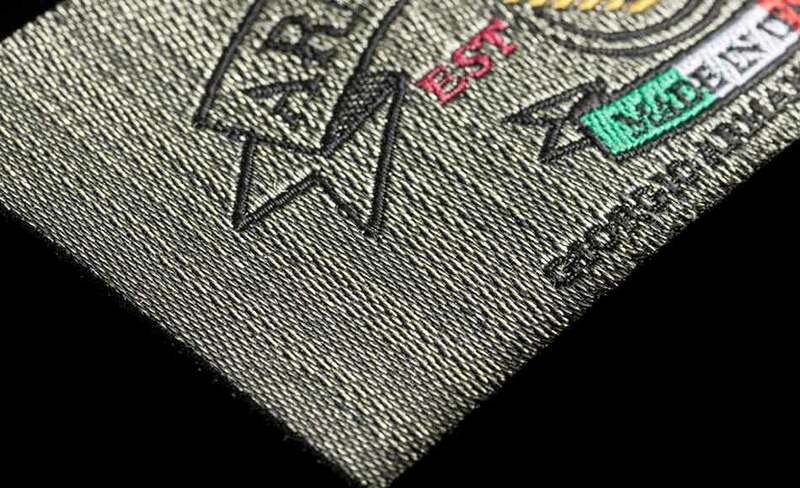 Ultrasound finish: this kind of finish can be replaced by both heat welded and close traditional selvedge labels, without any kind of height limitations. 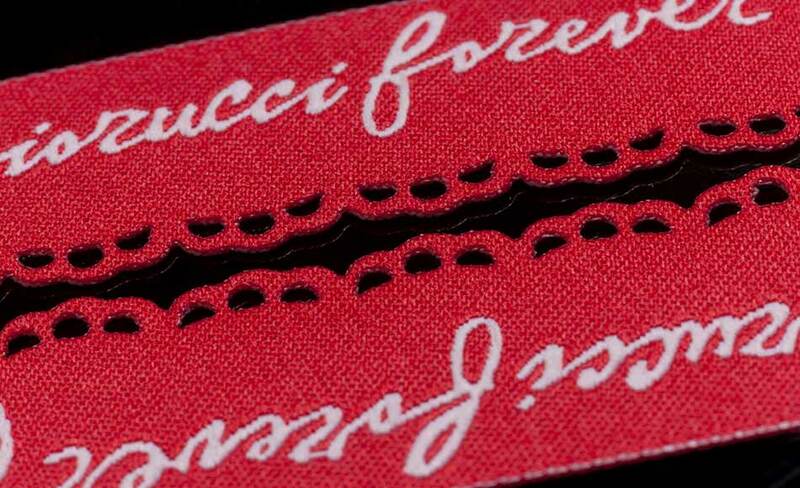 The label will be weaved always on the same loom of the heat welded finish but the thermal knives will be replaced by a blade ultrasound system, which allows to obtain a soft cut that doesn’t bother if it touches the skin. This finish is not recommended in case the clothing items have to be processed with typical jeans treatments (stone wash / stone bleach / paintings). This because the label can fray at the borders and unsolder, due to the lack of polyester fusion. 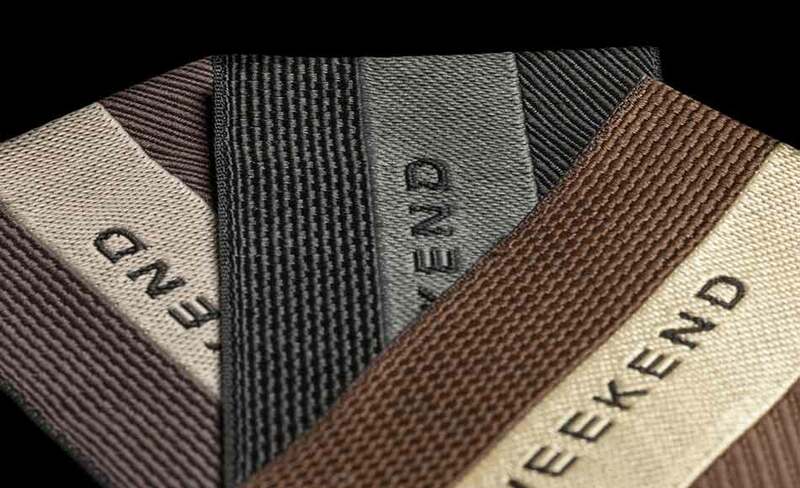 There are no restrictions concerning the types to be produced and we can make light or heavy weavings and use processing techniques according to their use, external and internal clothing, outwear, labels, underwear, shirts, leather goods, shoes and accessories. *Information on the current legislation regarding the processing of personal data. We inform you that personal data are available in hard copy, computerized and telematic and will be kept by us, for the management of business relationships and for sending information related to our activity.